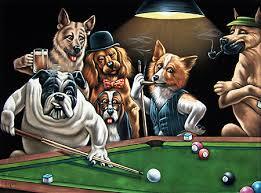 Lucy Turnbull has proudly unveiled the completed renovations of the Prime Minister’s official residence “The Lodge” to the media, in which pride of place has gone to a full set of the famous “Dogs Playing Pool” paintings. The media were also shown a selection of new crocheted toilet roll covers that the Turnbull’s picked up on Etsy. The front lawn has been ripped up and replaced with a broad expanse of small white pebbles, in the middle of which lies a water feature consisting of a blue ceramic globe. A big Buddha head the couple bought back from Bali sits in the corner of the yard. The shed has been converted into a ‘man-cave’ where the PM can show off his collection of signed sporting memorabilia to visiting foreign dignaitories. The choice of artwork has sparked controversy with Australian artists complaining that the Turnbull’s are ignoring local talent.